For an affordable and comfortable stay in Tomar, look out for the 2* Hotel Kamanga. A twin/double room costs as little as €40 a night and that includes a rather plentiful continental breakfast. Rooms in the Kamanga are fitted with en-suite facilities, have cable television and offer internet access. It’s clean and comfortable, and there is a lift for guests should you find yourself on the higher floors. The hotel is located in the centre of town and is a 5 minute walk away from some great restaurants, shops, bars and all the major tourist attractions. The Hotel Kamanga is run by some very friendly ladies who really make you feel at home, even if, like me, your Portuguese is limited to a couple of words. On a side note, it’s quite fun changing the words of ‘Hotel California’ to ‘Hotel Kamanga’, try it, it works well. Tomar is a beautiful yet quite small city, perfect for a long weekend break or a week’s rest and relaxation. It is also home to a UNESCO World Heritage Site, the Convent of Christ. 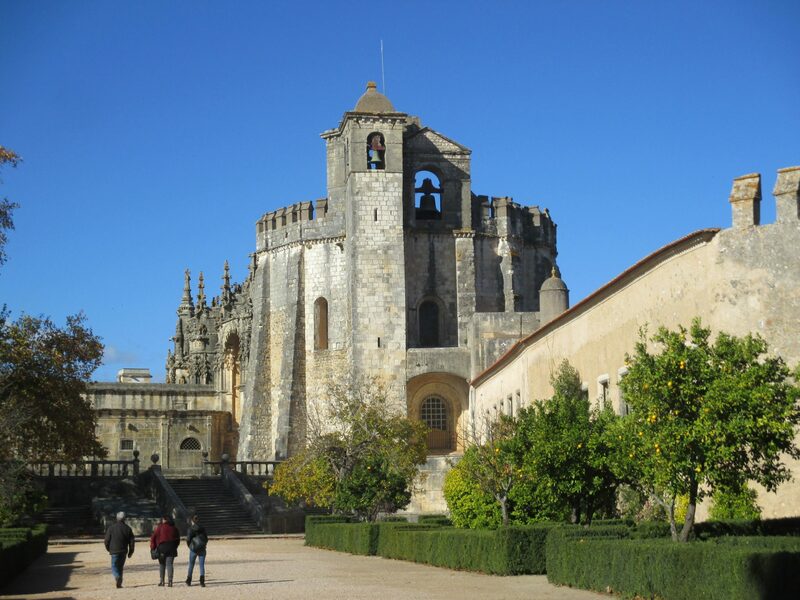 The convent of Christ or Convento de Cristo if you want to show off is a fantastic place to visit, once the headquarters of the Knights Templar. Entrance to the site is a very affordable €6 at time of writing and is in my opinion, worth every cent. The convent and castle are beautiful and offer many great photo opportunities. On a side note it also it sells swords and goblets in the gift shop. I have a goblet, the sword is on its way. As well as the Convent of Christ you should most definitely take a trip to the matchbox museum, home to over 40,000 matchboxes and the friendliest museum worker I have ever met! The museum itself is really quite a sight, you won’t believe how much space 40,000 matchboxes take up until you see it with your own eyes. People of a nervous disposition should be aware that there are a few ‘fruity’ boxes from the far east on show. It’s a PG13 rating in parts. Convent of Christ! What more could you want? If you are after the full on medieval experience you should try the Taverna Antiqua which is (suprisingly) a medieval themed restaurant. The food is made using traditional recipes and ingredients to create authentic, tasty and traditional food. The taverna is open from 12 so lunch and a large glass of mead is an option before you set of to explore Tomar. If that doesn’t sound like your idea of fun, Tomar has many other fine eateries for you to try. The Chinese restaurant whose name I forget is easily located on Rua Joáo Carlos Everard and is delicious. O Tabuleiro is the holder of many awards and excellent reviews. Finally Sirius Restaurante Bar Lounge is a cool place for lunch and a nice glass of wine, it is very reasonably priced, the staff are friendly and the choice of food varied and tasty. I spent New Year’s Eve there and was rather taken with some excellent flamenco dancing, though that might have been a one off. Tomar, like a lot of Portuguese places I’ve visited, is full of bars. Bars of all types, all sizes, all sorts. Bars, bars, bars. It’s impossible to pick one to recommend as all of the ones I visited were welcoming, cheap and quite a lot of fun. The best advice for where to drink is to explore the streets and pick one that takes your fancy. It seems that the bars in Tomar don’t really have an online presence so I can’t link to any of them anyway and I’m not overly sure what they are called if I’m honest. Two I can recommend without knowing the names, just the locations: a great wine bar near the main island leading to the N349-3, which is a great place to pass a rainy afternoon and sells quite beautiful chocolates. There is also a rather wonderful small bar with no name located at 60 Rua Marquês de Pombal. It sells wine in ceramic mugs, good Portuguese food and occasionally has live music in the evenings. Stay away from any caracóis á portuguesa unless you know what they are, you might be in for a nasty surprise, I was. Explore the narrow streets, visit the local shops, try the local wine and most definitely visit the convent.